Well, where I work we got last Monday off as a holiday; thanks to Cesar Chavez. I had a really nice 3-day weekend though I was sorry to see my daughter go back to school after her quarter break. She took her car back to school, a first, as you’re not allowed a vehicle until the last quarter of your sophomore year. Oh well, another level of freedom. Anyways, the holdiay afforded me 2 days to get out on the water. 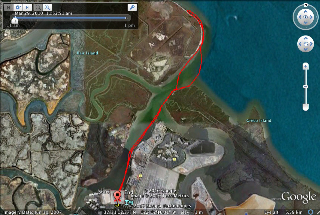 This was recorded from my Forerunner 305; Saturday’s route into Westpoint Slough. Saturday was nice and sunny with very little wind. This is one possible route which may serve as my monthly time trial. Rain was expected by Monday evening but it didn’t look too good in the morning and high winds were predicted by the afternoon. I decided to try to get out before the storm hit. I launched again at Redwood City Marina and went into the bay. The wind was definitely up and I went into a headwind so I’d have a tailwind back to the marina when I would be tired. Unfortunately, I was going against an ebb tide and when I turned off the bay into the main channel to the marina, I again had a head wind. I was scouting out longer workouts. The put-in at this marina is between two major bridges which cross over the bay. So it’s a good spot to develop much longer routes when my training gets lengthy. Here’s Monday’s route. This entry was posted on April 1, 2010 by DummyDiva. 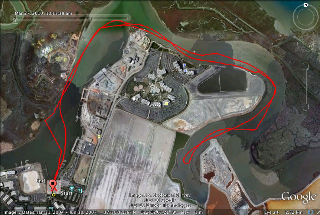 It was filed under Uncategorized and was tagged with Forerunner 305, kayaking, paddling, training, Westpoint Slough.